Pridi Hostel Bangkok i Bangkok, Thailand : Boka nu! Well known for our superb hospitality. Pridi Hostel have been receiving good reviews from our visitors and have many returned customers. PRIDI HOSTEL BANGKOK is a BRAND NEW BOUTIQUE HOSTEL: Great ambiance, Value for money, Clean, Comfortable, Easy to get around: Train from Suvarnaphumi Airport cost only 30 baht. Easy to get around by BTS Sky Train and MRT Underground Train to Shopping areas and Attractions like Siam, MBK, Silom, Asiatique, Weekend Market, Grand Palace, Kao San Road and many more. Providing all visitors with Quality Experience is our commitment. 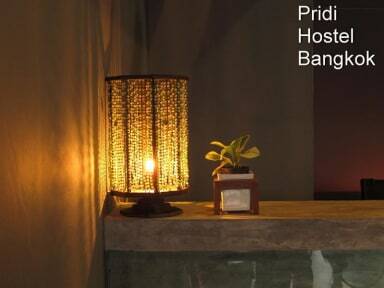 You will feel comfortable, Safe, Relax and Inspired at Pridi Hostel. 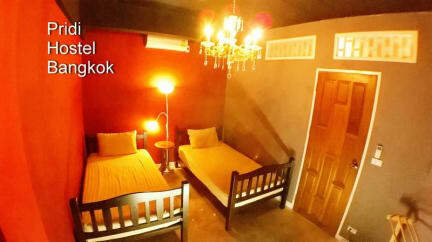 Our Premium 4 Bed Mix Dorm starts from only 320.-/night (from normally 450.-). We select Premium Quality 100% Egyptian Cotton Bed sheet, Hallmark King Size Pillow and Grade A mattress & Bed and for your comfort. The hostel is designed especially to inspire visitors who appreciate Thai Architecture with modern touch. Our English speaking staffs are friendly and committed to give the warmest Thai Hospitality to visitors. Pridi Hostel provides clean and comfortable beds with other facilities such as Hot Shower, Air-condition, shared and private bathroom, separate shower and toilet, Laundry, Free Hi-speed Internet & Wi-Fi. Our fresh brew coffee is also known as one of the best in town.